More Video Resources! Download them now. INM Resource Page has lots of handouts, pics, talking points, and worship ideas. Check it out! Malaria kills more than a million kids per year. But $10 can save a life. As of July 10, 2013 our total is $1,143,620 - 114,362 lives saved. Download this list of links to free resources and ministry ideas. 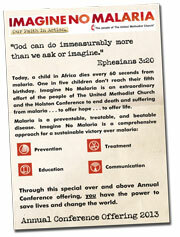 Imagine No Malaria is an initiative of the people of The United Methodist Church to raise $75 million to eliminate malaria deaths in Africa by 2015. 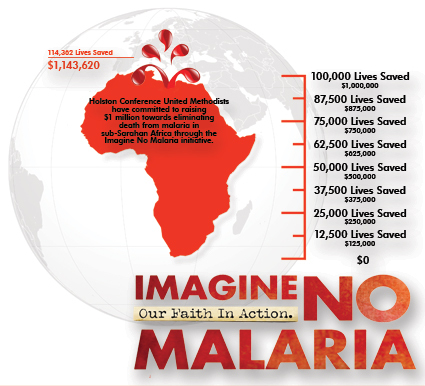 In partnership with our brothers and sisters in Africa, the gifts and resources shared through Imagine No Malaria will empower an entire continent to achieve a sustainable victory over the disease. We will accomplish this goal together with a comprehensive approach to fighting malaria that includes improving prevention, education, communication and treatment. For questions, resources, or additional ideas, contact LeRae Collins, Imagine No Malaria coordinator, [email protected] or (865) 293-4133.